Spain…Soccer World Superstar. But what about Stem Cells?! If there was a World Cup for Stem Cells, Spain would get that too! While Spain is the world leader of Soccer, they are also the dominant player in a new arena of Adipose Stem Cell Research. Adipose stem cells come from your own fat. The first step in extracting them is via a Liposuction Procedure. According to information publicly available at ClinicalTrials.gov, Spain is the leader in Clinical Trials using Adipose Stem Cells. And just like Soccer, compared to other countries, it’s not even close! 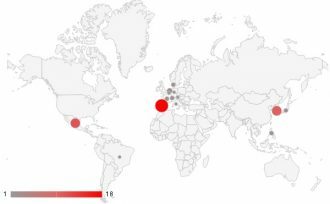 As of early June 2012, Spain has registered at least 18 different Clinical Trial locations using Adipose Stem Cells. Mexico and Korea are next with 11 and 10 trials respectively. And what of the great USA, the hot bed of medical innovation? We have a grand total of 3 trials . We pose the question: Has any U.S. money gone to funding these overseas trials? Have any of these trials been funded by U.S. charitable organizations, institutions, or American Venture Capital? While we are happy to see the sector forward *anywhere*, it is somewhat disappointing that U.S. patients have such a limited access to these promising new therapies. We welcome your thoughts on this. According to ClinicalTrials.gov a total of 54 clinical trials using Adipose Stem Cells have been registered since 2004. Clinical Trials are being conducted all over the world using stem cells derived from your own adipose fat tissue. Indications include arthritis, autism, cardiac, Crohn’s, diabetes, fistula, immune, kidney, liver, multiple sclerosis, neuro, orthopedic, pulmonary, vascular and wound care. There are at least 27 trials currently recruiting . 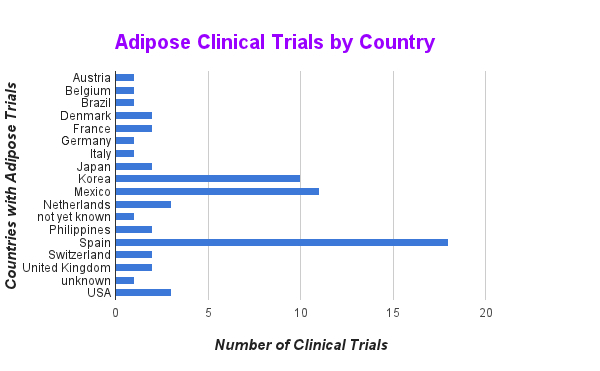 Some individual Adipose Stem Cell Clinical Trials are being conducted in multiple countries. But no matter how you slice it, Spain is leading the pack! Read more about our Adipose Stem Cell Clinical Trial Tracking in our June 4, 2012 blog post. Part 2: Adipose Stem Cell Clinical Trials by Donor Source, Autologous vs. Allogeneic- What’s up with that? Thank you very much for the courtesy. Very valuable information. I want to cite your work in my presentation, but who should I mention? Ricardo L Rodriguez , or Leeza Rodriguez ?